Yes, we understand that real estate terminology can be confusing, especially for first time home buyers. 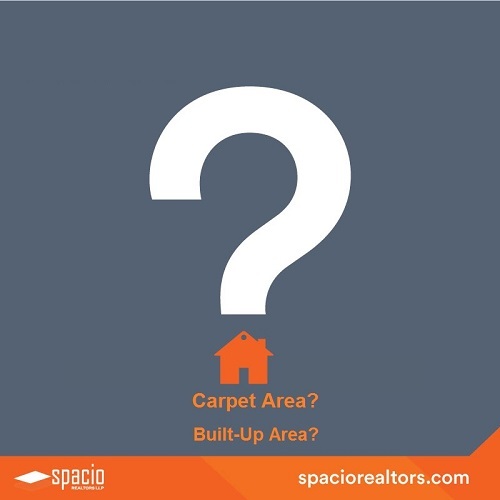 This article, the first in a six part series by Spacio Realtors explains the terms related to area of a property like built-up area, carpet area, etc. This is the net usable floor area within the flat/apartment i.e. the area within the walls of the flat, actual area to lay the carpet. This does not include the thickness of the inner walls, but includes the door jams. This is the area which includes the carpet area plus the thickness of the walls and balcony including cantilevered portion. Super built-up area includes carpet area, the area occupied by the walls and your apartment, proportionate share of the common spaces of the building such as the lobby, lift, staircase and corridors. Some builders even include the terrace, pump house, security room, swimming pool, garden, club house, the area occupied by the compound wall of the building. The total area of these is divided by the number of flats in proportion to their size and the result is the super built-up area. Under the new Real Estate Regulatory Bill, the sale can be done only on the basis of Carpet area. FSI or FAR indicates the maximum amount of construction allowed on a given plot of land. This is purely dependent on the plot area. It’s the ratio of the total area of all the floors in a building to the total plot area. So if the FSI is 2, the total floor area of a multi storied building cannot exceed twice the size of the plot. In Mumbai, Rule 2(3L)(42) of the Development Control Regulation for Greater Mumbai 1991 (DCR) defines FSI as the quotient of the ratio of the combined gross floor area of all floors, excepting areas specifically exempted under these regulations, to the total area of plot. In certain circumstances, the development potential of a plot of land may be separated from the land itself and may be made available to the owner of the land in the form of Transferable Development Rights (TDR). TDR is granted in lieu of relinquishment or surrender by the owner of the land / property for public utilities like road widening, playgrounds, civil amenities etc. The TDR is generally transferable and tradable in the market. TDR enables the holder to construct the permissible construction area elsewhere in the same city at the same market value. This is the first post of our real estate terminology series. Subscribe to our blog via email so you never miss a post from this series and other interesting property tips. Next > How to find the official value of a property in India?